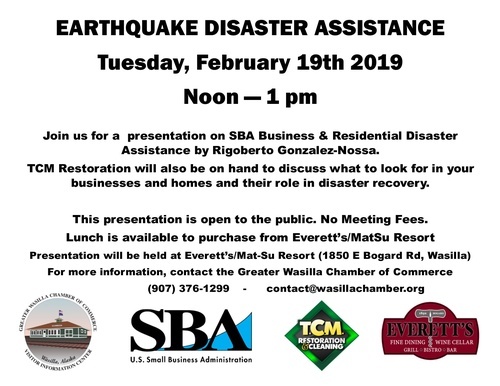 Join us for a presentation on SBA Business & Residential Disaster Assistance by Rigoberto Gonzalez-Nossa. TCM Restoration will also be on hand to discuss what to look for in your businesses and homes and their role in disaster recovery. We will also have a representative from MatSu Borough Emergency Management to answer any questions you may have. This presentation is open to the public. No Meeting Fees.